Bant Kaur is content with life. 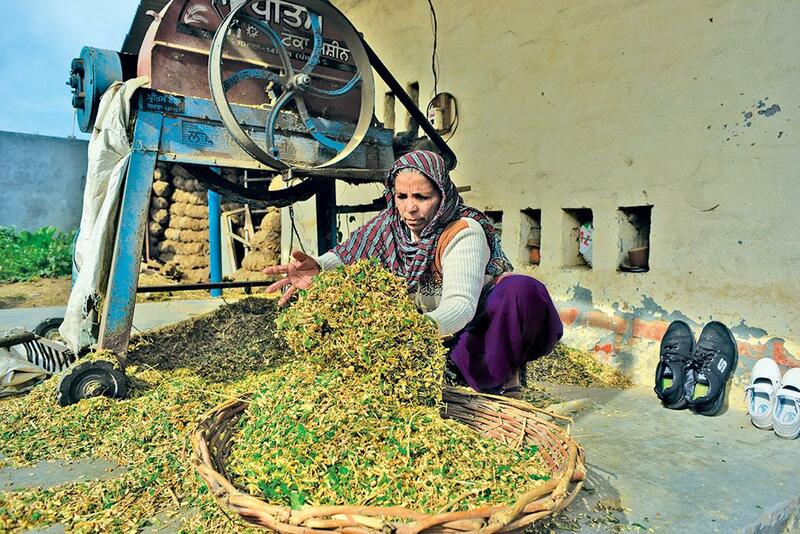 On a chilly January morning, the 50-something widow is busy feeding luscious green fodder to her buffalo, milking it and cooking for her 15-year-old son before leaving for work at 8 in the morning. Resident of Punjab’s Balad Kalan village in Sangrur district, she works on daily wage at construction sites or brick kilns on days she fails to get work under the Mahatma Gandhi National Rural Employment Guarantee Act (MGNREGA). But life was not always so good. Kaur lost her husband in a road accident in 2011. She had barely brought herself together when a minor ailment took away her 23-year-old son. The only source of income left for her and her younger son was the buffalo, which gave just a little milk. She would spend the entire day searching for green fodder. Most of the times, she would return home empty-handed and feed the animal roadside grass. When lucky, she would be allowed inside the village common land cultivated by rich landlords. Her buffalo would be well-fed on these days and give more and good quality milk. Things changed after 2014. That year, Kaur’s village witnessed an uprising. People protested against the big landlords, mostly the Jatt-Sikh community, who had taken control of fertile common lands reserved for the Scheduled Castes, popularly known as Dalits. The state has a history of local communities using and managing common lands. The Punjab Village Common Lands Regulation Act 1961 provides guidance on how common lands, which are managed by panchayats, should be used. It sets aside one-third of the community land, locally called shamilat deh, for Dalits. The state government, in its effort to uplift the marginalised Dalits, distributed among them nazul land, left by the communities that migrated to Pakistan during Partition. The state also gave Dalits 25 per cent reservation instead of the Centre’s 15 per cent. Yet, the community owns negligible cultivable land. 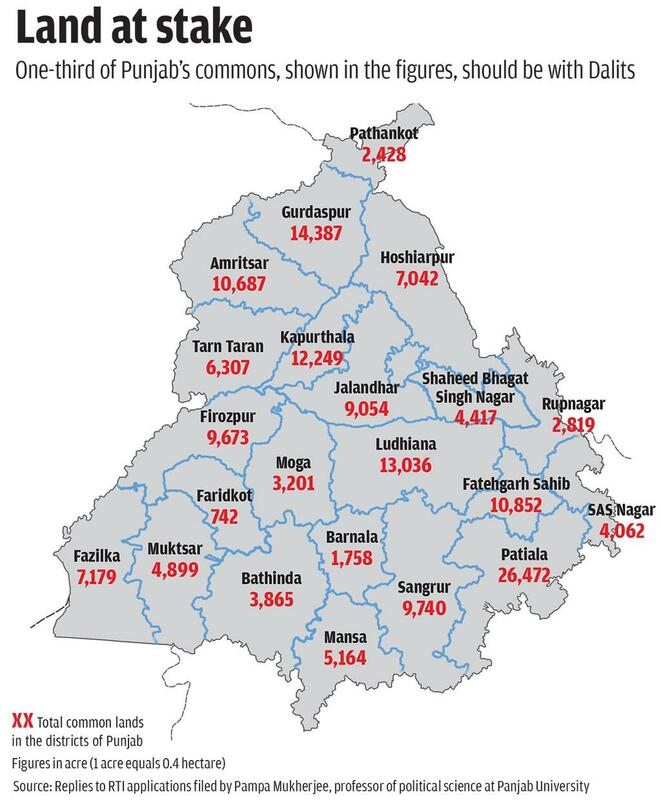 “A good 31.94 per cent of Punjab’s population comprises Dalits, but the community has only 3.2 per cent of cultivable land under its control,” says Ronki Ram, professor of political science at the Panjab University. “The state has over 68,013 hectares common land across 13,000 villages. Dalits own 20,800 hectares of this, but only on paper,” says Pampa Mukherjee, also a political science professor at the Panjab University (see ‘Land at stake’, p18). The 2014 uprising turned the tide against the existing system. Under the banner of Jameen Prapti Sangharsh Committee (JPSC), the community started a movement from Balad Kalan to rightfully cultivate shamilat deh. It made life easy for people like Kaur for whom cattle-rearing forms a big part of the family income. “The rich do not abuse or harass us now. They don’t even force us to work without payment (begari),” she says. With healthy green fodder, Kaur’s buffalo gives four litres of milk, ensuring at least Rs 180 every day. The movement caught steam in Balad Kalan when the Dalits decided to take part in the bidding process for the 53-hectare common land. The procedure decides who would cultivate the common land that year. The panchayat sets the minimum bidding amount— 5 per cent more than the previous year’s amount. Aware that the Dalits could not compete monetarily with the rich Jatt farmers, the community went for joint bidding. Each family pitched in the amount it could afford. But the rich landowners were not ready to let go of the land. “They ensured that bidding was held behind closed doors at the block office in Bhavanigarh without Dalits,” says 60-year-old farmer Ajaib Singh. Landowners have a history of placing dummy candidates from the Dalit community, thus ensuring hands-down victory in the auction. “They make this possible using the siri system which has been prevalent in Punjab for the past many decades,” says Ram, who has done extensive work on caste system in the state. “As per this system, Dalits can take loans from landowners during financial crises. In lieu of this, they do routine labour at landowners’ farms for the rest of their lives. They were also used as dummy candidates during biddings to take control over common lands,” he adds. Protests against the bidding result in front of the block office led to police lathi-charge and the arrest of around 40 men and some women. The women were released after 12 hours, but men continued their agitation from behind bars. They ensured that no one applied for their bail. Finally, police were forced to release them without bail. Many demonstrations later, people managed to get the 53 hectares, one-third of 160 hectares common land, which was distributed among 145 families of Sangrur. Inspired by the story of Balad Kalan, the marginalised community of villages nearby replicated the joint bidding model. In Bharo village, people took control over 11.6 hectares of common land. The big landlords did not pose stiff opposition this time. The land was distributed among 180 Dalit families, says Krishan Singh of JPSC. Now, the movement has spread across 40 villages of Sangrur and more than 10 villages in neighbouring Patiala district, say members of JPSC and Krantikari Pendu Mazdoor Union, also part of the movement. However, the transition was not smooth everywhere. There were intense fights and violence in many villages in 2016. In Jhaloor, about 50 km from Balad Kalan, people stayed put for 28 days on the village common land. Resident Balwinder Singh says police arrested about 10 people. Later, all were released without bail application. But the worst occurred on October 5, 2016, when unknown persons attacked many Dalits in the village. Balwinder’s mother was attacked with a sharp-edged weapon in which she lost her left leg. After a month of treatment, she succumbed to the injuries. But residents of the village now cultivate about 7 hectares. The protests did not end here. A series of agitations was organised across the state to reduce the bidding price, says Mukesh Malaudh, JPSC president. Balad Kalan spearheaded this movement as well. Once again, the police intervened, people were arrested, but the authorities finally relented. Now, Dalits bid at Rs 20,000 per 0.4 hectare, while the others bid somewhere around Rs 70,000. The success, however, has taken its toll. FIRs have been filed against at least 350 residents of these villages under different sections of the Indian Penal Code (IPC), says Malaudh. Local court has declared him a proclaimed offender. He is booked in 28 cases, including four charges of attempt to murder. “Now, JPSC has decided to campaign for a 99-year lease at a nominal rent. Bidding every year is a herculean task, ” he says. 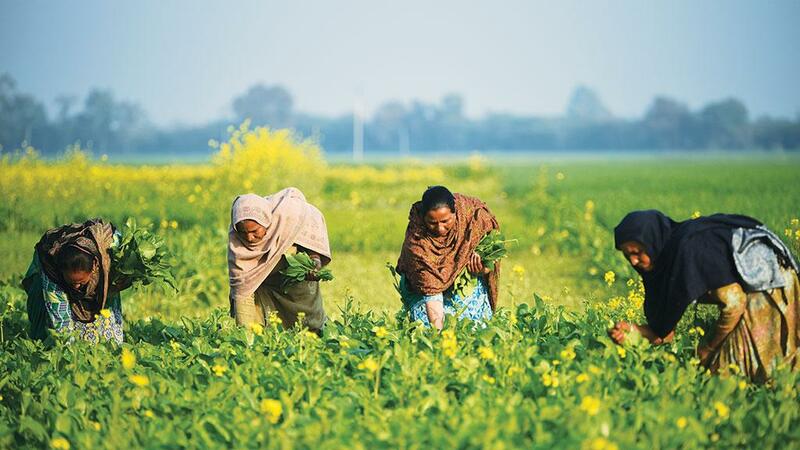 To ensure that the model for collec tive bidding and to cultivate land continues to work, an 11-member cooperative society has been formed in each village for managing the land. The total land acquired has been distributed among the Dalit families in proportion to the monetary contribution. For instance, Kaur contributed Rs 11,000 in the bidding and received 0.32 hectares, or three bighas. She uses half a bigha to grow fodder. The cooperative society uses the rest for cultivation. The money earned is used in the next year’s bidding. The remaining money and grains are distributed among the families. This is the story of all Dalit farmers in Balad Kalan. Kaur received five quintals of wheat last year and a trolley of husk. She will also get the rice grown in 2018. This, she said, is a lot for her. Forty eight-year-old Sindherpal Kaur of Bharo village, who earlier had one buffalo, has bought three more and started dairy farming. Better income has helped her develop the necessary infrastructure to sell milk. She also owns small vehicles needed for the purpose. Village sarpanch Vikram Singh says that people who were interested in dairy business earlier took land from landlords at Rs 15,000 for three months. Now, they pay Rs 3,500 for a year. The cooperative society uses only local labourers for farm work, be it for sowing, spraying medicines or for harvesting. Wages for workers have also been fixed. Close on the heels of the movement, the Dalits of Punjab were dealt with a mighty blow from the state government. In its 2017 Budget, Punjab announced that it would turn about 1,618 hectares in Sangrur and nearby districts into an industrial park. Balad Kalan has to contribute 40 hectares to the park. All of this will be community land, says sarpanch Gurudev Singh. Residents of Balad Kalan claim it is the state government’s way to crush their movement. "The government tried to create fear among people by lathi-charging them and putting them behind bars. When this did not work, it thought of the industrial park to grab the land,” says 65-year-old farmer Jai Singh. He was in jail for more than two months in the 2014 uprising. His son was arrested in 2016 during protests to reduce the bidding price. It’s a déjà vu moment for the people of Balad Kalan. They are all set to fight their second battle to reclaim the land that is rightfully their own. When the state government officials visited the village to conduct a survey in January 2018, residents protested. But they were forced out of the land, says the village sarpanch. "The government officials who claimed they would conduct the survey only after the panchayat gave its nod, have already completed the process in Nizampur village nearby,” says Malaudh. “We will oppose the move tooth and nail and make the government understand that the land provides Dalits not only live-lihood, but dignity as well,” he says.